Through the course of the last hundred years, Berlin's architects have moved away from masonry and toward glass. Perhaps it's a vestige of Berliner Moderne's fixation with light and sun. How much air it provides is another matter, because architects who call for curtain walls usually hate windows that open. Here we are at the Theater des Westerns. Josephine Baker appeared here; so did Enrico Caruso and Marlene Dietrich. It's still an active performance venue. But the hulk itself? It was built in 1895-96 to a design by Bernhard Sehring in a style described as Wilhelmine historicism. Watch as solid walls such as these gradually vanish from the buildings erected in Berlin over the following century. Not a lot more glass here, but the walls are getting pared down. What is it? It's the office wing of Templehof Airport. 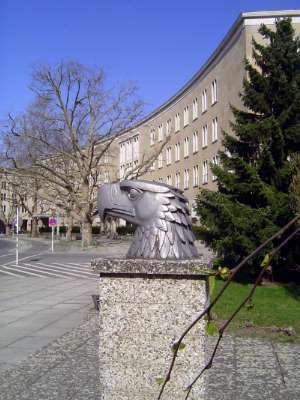 The iron eagle on the roof was taken down in 1962; only the head survives, grounded. It used to be perched up there on the little pedestal. 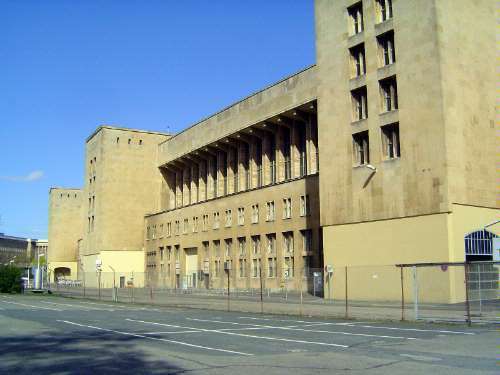 The whole building was designed by Ernst Sagabiel as part of Albert Speer's plan for Berlin. 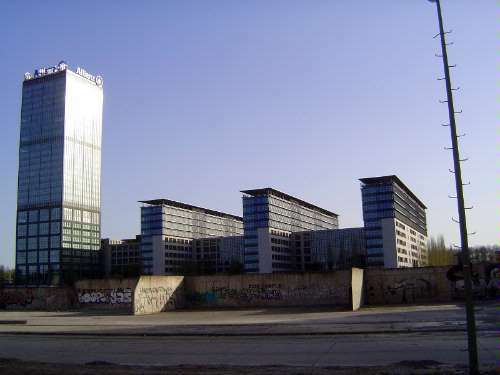 The plaza is deserted because Templehof closed in 2008. The name is familiar to Americans mostly because of the Berlin airlift, the "air bridge" that operated here in 1948 and 1949. The airport concourse radiated from both sides of that entrance hall to form a quarter-circle over a kilometer in length. The other side of the structure was a huge roof, so aircraft could park under cover. The airport was supposed to be Lufthansa's headquarters, but that never happened. PanAm flew here from 1950 to 1975. More glass still. 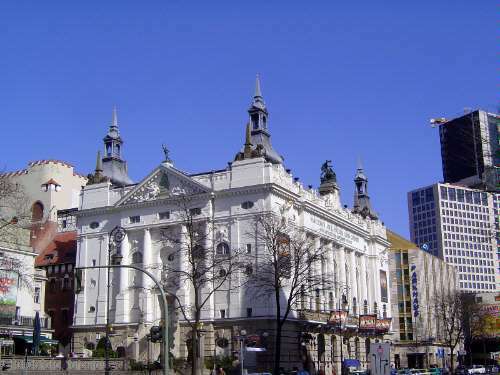 This is now called the Pallaseeum, from the Pallasstrasse it straddles, but it was originally the Sozialpalast, a palace for the common man. By whatever name, it contains over 500 apartments and has come back from a nadir in the 1990s, when it was almost demolished. 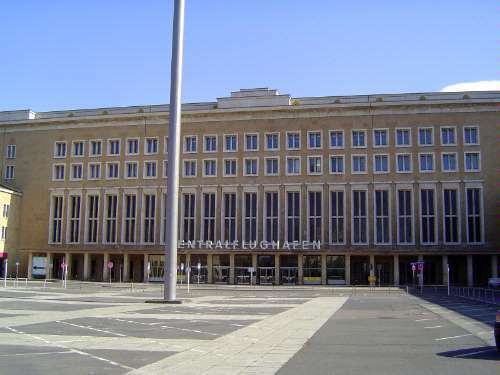 Designed by Jurgen Sawade, the building was begun in 1977 on the site of the Berlin sports palace, built in 1910 for winter sports but often used in later years for political rallies. More, more, more. 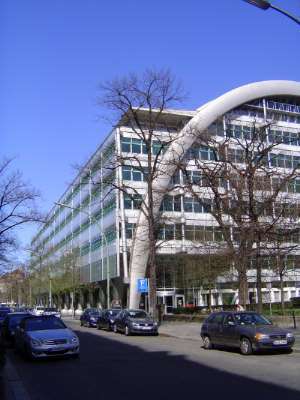 Alliance Real Estate is one of the largest landlords of office and retail space in Europe and appropriately enough is housed in Germany's tallest office building, which is part of Treptowers, built in 1998 on the site of the 1926 workshops of AEG, or German General Electric. The concrete in the foreground is the bed of the Spree River. 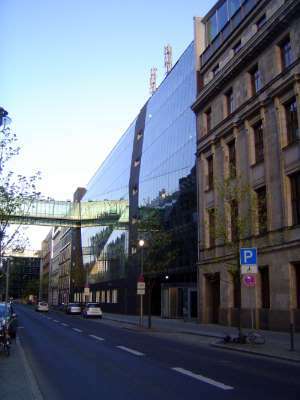 This is Ludwig Erhard Haus, completed in 1998 and designed by Nicholas Grimshaw. It's the home of the Industrie-und Handels Kammer, or Chamber of Commerce and Industry. 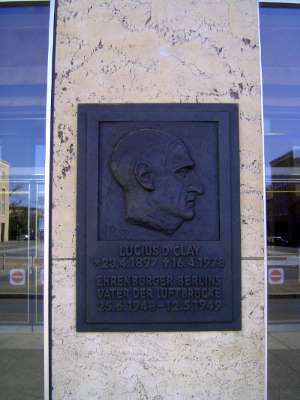 It also houses the Berlin Stock Exchange. The structure consists of 15 immense arches, and its exterior would have followed their curves if the local government had not insisted on conventional, vertical walls. 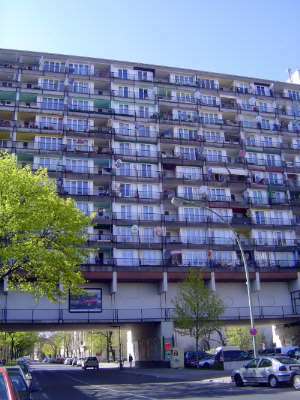 Standards change, and walls were allowed to deviate from flat planes in this, one of the eight buildings of the Jakob-Kaiser-Haus, which opened in 2002 and provides offices for members of the German parliament.